This article explains how to connect a servo to a flight controller and configure it for use as a gripper which is useful for delivery or bottle drop applications. The servo can be controlled directly by the pilot via a switch on the transmitter or as part of a mission. You may wish to refer to the general servo wiki page for other ways servos can be controlled. If using Copter, connect the servo to AUX OUT 1, 2, 3 or 4. MAIN OUT 1 ~ 8 should be avoided because these update at 400hz. If using Plane or Rover where all pins update at 50hz, any unused MAIN OUT or AUX OUT 1 ~ 4 may be used. AUX OUT 5 and 6 cannot be used by default because they are setup as Relays. These pins can changed to Servo outputs by setting the BRD_PWM_COUNT parameter to 6 and setting RELAY_PIN and RELAY_PIN2 to -1. The Pixhawk flight controller cannot provide power to the servos so an external BEC or ESC that can provide 5V should be used. set which RC output is used by setting SERVOx_FUNCTION (or RCX_FUNCTION) to 28 (i.e. if using AUX OUT 1 on a Pixhawk, set SERVO9_FUNCTION to 28). GRIP_ENABLE to 1 to enable the gripper feature and then refetch parameters from the ground station in order to make other gripper parameters visible. The transmitter’s auxiliary switch can control the gripper. 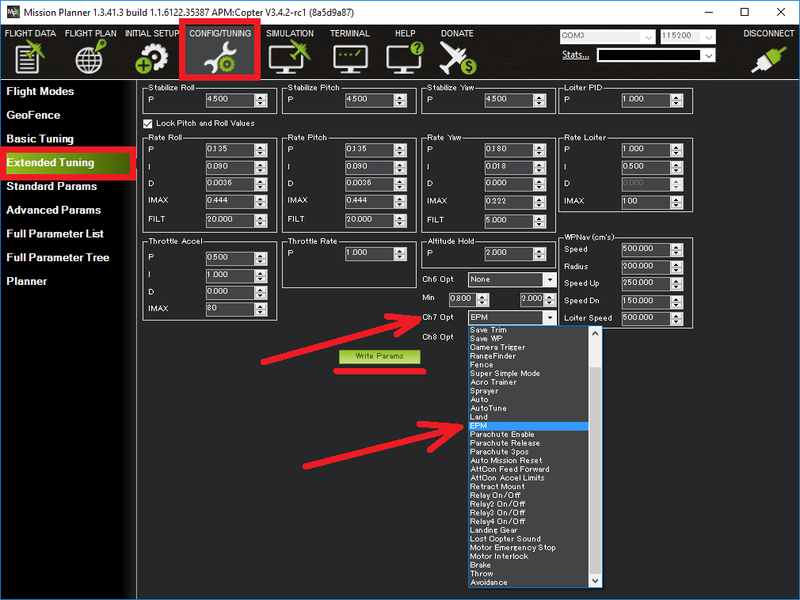 If using the mission planner, select Config/Tuning > Extended Tuning and set the Ch7 Opt or Ch8 Opt drop-down to “EPM” or “Gripper”. The gripper position can be controlled during a mission in AUTO mode using the DO_GRIPPER command. Set the “drop/grab” column to 0 to close the gripper, 1 to open the gripper. The gripper can be opened or closed in real-time from the ground station if the ground station sends a COMMAND_LONG with the command field set to DO_GRIPPER (i.e. 211) but there are no ground stations (as far as we know) that support doing this.